There are three basic kinds of golf grips that are used to play the game: the interlocking grip, the baseball grip and the backwards putting grip. The interlocking grip and the baseball grip can be used for any kind of golf stroke, while the backwards putting grip is used only for putting. In order to use each grip properly, it is important to understand the fundamentals of each one. The interlocking grip is the grip most taught in golf, and it is the grip that most teachers refer to simply as the "golf grip." For right-handed players, take the club with your right hand at the bottom of the soft grip on the club shaft. Interlock the pointer finger on your left hand with the pinky finger on your right hand. Place your thumbs in a straight light down the shaft of the club pointing at the top of the center of the club head, and then wrap the rest of your fingers around the shaft. The process is the same for left-handed golfers but the hands are reversed. 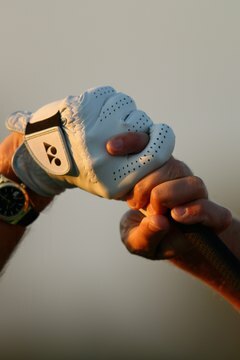 This grip is most effective in golf because it keeps your two hands moving together in one motion, which helps to increase the control you have over the club. When you grip the club in this manner, do not squeeze too tightly. You want the club shaft to have a little mobility in your grip to allow for smoother contact with the ball. Practice this grip and you will find that you have much more control over the motion of the club in your swing than you do with the baseball grip. The baseball grip in golf is the same as the baseball grip in baseball. For right-handed golfers, simply grip the club with your right hand at the bottom of the shaft grip and your left hand at the top. The process is the same for left-handed golfers but the hands are reversed. The baseball grip is discouraged among golf teachers as it does nothing to insure that the two hands are working together in a singular motion during the swing. With a baseball swing, it is possible to flex your right wrist during your back swing, as you are supposed to do, but your left wrist might remain straight. Not only does this have the potential to be painful, but it is also going to cause the ball to go in random directions on contact. This grip is becoming very popular on the professional tour, and many teachers are recommending that their students try it. The grip is essentially the same as the baseball grip but with the hands reversed. For right-handed players the left hand would now be on the bottom of the shaft grip as opposed to the top. It is reversed for left-handed players. The bulk of the putting motion is done with the bottom hand as it carefully pulls the putter towards the ball, as opposed to the bottom hand pushing the putter to the ball as would be the case with the standard grip. The top hand acts as a pivot, and the golfer can realize much more precise control over the putter with a grip like this. The key is to not interlock your fingers, and practice developing the right speed for your club head on the practice green before you get out on the course.